I Heart Kroger listed the inclusions for the Mega Sale going on in the next two weeks. And it's looking great! Lots of FREE Rotel, Jello pudding, Reach floss and more. The only problem is I don't have any coupons for the deals! For the last two weeks, for one reason or another, I didn't get the Sunday paper. Normally, I just accept the loss and move on. After all, we're supposed to be in a Pantry Challenge all month. But when I saw this list for Kroger's Mega Sale, I quickly changed my mind. I want to go grocery shopping. Lots of people get coupons from Ebay. I'm not a real big fan of Ebay. So instead, I get it from a clipping service. I don't remember how I found out about Coupon Dede but I've only had a good experience from her the two times I did order coupons online. I paid $5.26 for 40 coupons and will save about $35 during the next two weeks. Considering that 2 newspapers from the Sundays I missed buying them cost $4, I'm only paying extra for shipping and handling. Since the sale is two weeks long, it's ok if I don't get the coupons by Friday. But I did buy enough to where I could have a little stockpile that should last us a couple months. 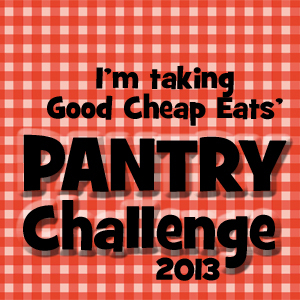 This is week 4 of the Pantry Challenge. And I am so looking forward to making other dishes besides the same old stuff in my freezer and pantry. We ran out of the basics so I went grocery shopping this weekend. It's hard for me to deviate from the plan without feeling guilty so I just remind myself that the point is to pare down the pantry, which we are doing. Tonight, I made cupcakes for tomorrow and some for the freezer. I cooked the rice and beans going into the burritos as well as the potato stew and rice porridge. Even though we are eating much less than normal with lots of soups and meatless dishes, no one is complaining too much because there is usually dessert served. We also have lots of cereal left that can be eaten for snack in between meals. Plus plenty of holiday candy to add a little happy to the pantry challenge. Visit orgjunkie to link-up your menu plan! Want to buy an item but the store is out-of-stock? 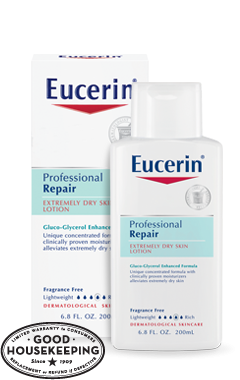 Ask for a substitution besides a raincheck. A couple of our grocery stores offer points for purchases that give discount at the gas pump. One store, Martin's gives 10-cents a gallon discount for every $100 purchase. Also, every week, they offer higher discounts when purchasing select items. Since we were running low on gas, I decided to do a couple of these gas deals at Martin's and get $0.40 off a gallon. One of the deals was buy 4 Puffs tissues and get $0.20 off a gallon. Being Saturday and the last day of the sale, the shelf was bare. Not one Puffs left, only Scotties tissues. She was obviously tired of helping me and didn't want to be bothered. So I left, head down in disappointment. I still got the rain check. But I knew that I needed it that day so we could fuel up on gas. My husband encouraged me and suggested speaking to the store manager. I really was hungry and wanted to go home and forget about the whole thing. Instead, I decided to check out the shelf myself and see if the cashier overlooked something. Well, she was right that it was $1.79 a box. But intermingled with those boxes were the ones for $1.25 each. They looked exactly the same but one was 100 sheets and the other 70 count. Why would Scotties tissues do that to the consumer, I don't know why. When I went back to customer service, they gave me $0.40 off, double what I expected. And I still have a raincheck for the Puffs deals. At the gas pump, we paid $2.55 a gallon. So yes, next time I will remember to ask for a substitution when they are out of stock of the products I need for a deal. And to personally investigate when it doesn't work out. It seemed like a lot of extra work, but it really only took 5 minutes from start to finish. The final outcome, saving $10 at the pump, was well worth the effort! Our children couldn't wait and already played in the slushy snow outside. Snow is such a novelty for us former Floridians! We started making paper snowflakes like super easy and gorgeous 3-d snowflakes. These are pretty large, maybe almost 2 feet wide. Of course I had to google 6-point paper snowflakes. There are also snowflake templates that can be printed and cut-out. I bought this blue foil wrapping paper from CVS discounted to $0.99 in the Hanukkah section. Then we glued the snowflakes made mostly from white cupcake liners. It makes a great backdrop for pictures! Blogger is not letting me upload pics, but I will try tomorrow! Use Loyalty Cards to Save at the Store! Everyone knows this because the cashier will typically ask for it during checkout. But until recently, even the stores I frequent had lots more to offer that I didn't know about just with using these cards. At Food Lion: Scan the MVP card at their "magic" coupon machine for a variety of coupons. Some are store coupons that can only be used that day, like $2 off $10 in produce. Others are manufacturer's coupons similar to those from coupons.com that have a longer expiration date. I like these because when I don't need all the coupons, I can leave some on the machine for others. Coupon sources for Food Lion include, Redplum from their website, Saving Star coupons, and from the newsletter emailed weekly. Sometimes they have Blue Moon mail-in-rebates with the Redplum coupons too. One time, I got $5 off $5 emailed to me. These do not require using the MVP card but I thought it worth mentioning. At Kroger: Register the card online to load e-coupons. Recently, I got meat, produce, and bakery coupons. Also, many coupons are similar to the ones from the newspaper. At Martin's: They have their own coupon machine that rarely gives great coupons. They do have an old standby like $.50 off $5 worth of produce. But sometimes, I get nice catalina coupons during checkout. At Winn-Dixie: Fill out the registration form for a new card, if you haven't done so with your current card. Once I got weekly coupons mailed to me, each with $10 off $50. I got full support for my couponing when my husband redeemed a $5 off steak coupon from Winn-Dixie. I think he only spent $0.25 for the steak! Walgreens has a new loyalty card but so far is not producing promising savings. That's all I can think of for right now. It just started snowing here for the first time this winter so we're going out to enjoy. Keep warm and dry, everyone! Wow! I can't even count how many bags of rice I got for free at Food Lion since they started the My Essentials promotion. This is the rebranded store brand line. They also have the coupon generating machines that can easily be confused with Blockbuster Express. Both are blue boxy machines near the store entrance. Similar to the "magic" CVS coupon machine, scan the MVP card before you shop and prepare to be surprised. True, it's up in the air what you will get. But I often get $0.75 off My Essentials rice. Right now, they are on sale for $0.69 for the 1-lb bag, so I actually got overage when I used it yesterday. Sometimes, I get $1 off frozen potatoes, so only $0.99 for a bag of tater tots or fries. Plus, they still have the promotion, "Get $1 for buying 4 My Essentials" plus $0.25 more for each extra item purchased. 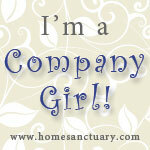 Check out Southern Savers long price list of these store brand items to see what you can score. I see canned veggies, beans or tomatoes around $0.45 regular price. That comes out to $0.20 a can after the catalina coupon. So essentially, buy 4 bags of rice at $0.69 each, pay $2.76, get $1 coupon off your next purchase. That is like paying only $1.76 for four, or $0.45 each. Don't forget to stick these in the freezer overnight to kill any bugs in them. And on another side note, the Food Lion I went to had Near East Cous Cous for only $1.48 a box, which is my old Publix stock-up price for these. I was very pleased to see Food Lion even had these. And it was just regular price. On New Year's Eve, we barely celebrated because the flu came upon the family and didn't leave until last week. Thankfully, it was only a mild cold, sore throat, and fever. But it took it's time, taking each person out one at a time. We still ate mostly from the pantry. It worked out since it was better to keep the cold away from the unsuspecting public. But I did shop for milk and other staples, especially since I won $12 from the Kroger Pop & Save sweeps. We've had meatballs, tacos, fried rice and lots and lots of soup. I made lemon meringue, pumpkin muffins, pumpkin dip and molasses cookies. Now we are out of flour, butter and only have ham for meat. We did go out for Mc Donald's and Little Ceasar's a couple times. It gets tiring having to prepare every single person's meal every single day. And one Friday movie night, I bought frozen corndogs and fries to go with our pizza. This was requested by the sick people so I was happy to oblige. Later I hope to put up some pictures but right now blogger is acting up. Must be because of the snow storm coming up our way! It seems like I would get tired of Christmas clearance, but after a little break, I can take more, especially if it has to do with more chocolate! While the children were in Awana last night, we stopped by Office Max to get $5 worth of items and 5 FREE notebooks. I was thinking of the $5- 100 pack page protectors but then I saw their Christmas clearance. Right by the cash registers, they had an array of holiday items including $0.99 wrapping paper, $4.40 Christmas cards, $0.50 Thank You cards, $1.99 large Pez package, and such. Many were overpriced. But I thought the candy was decent: Lindt chocolate $1.50, soft caramels $1.50, peanut brittle $0.70, and none looked Christmas-y. So they can be for Valentine's easily, if they make it that long! 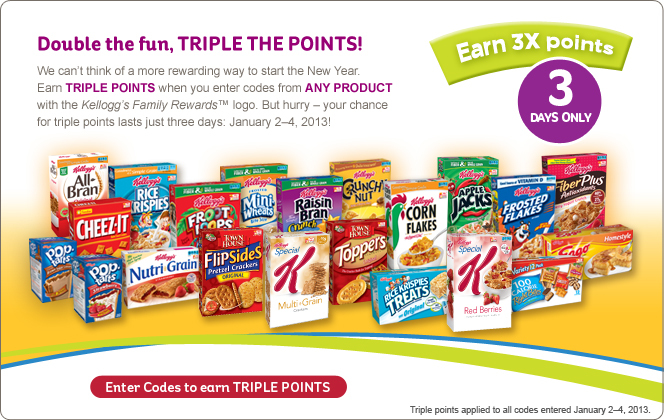 Today and tomorrow, earn triple points for any codes entered at Kelloggs Family Rewards. It appears that non-product codes are also working, based on comment from Totally Target. 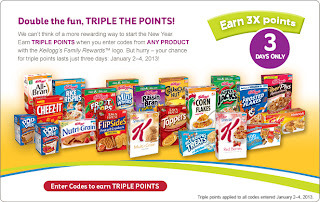 Coupons for $1.50 off many Kelloggs products are available in the Kelloggs Family Rewards site. BUT, I'm saving my points for the next time they have their coupons available for only 150 points. Last time I was able to print up to 12 coupons each time. It is that time of year. The hopeful beginning each January brings reels me into a dreamy state of goal-setting. It was motivating to get on the ball and plan after reading goals set by fellow readers at Money Saving Mom. But as I thought about all the things in my life that need improving, a chorus of a song came to mind. It's from my husband's song called "Chasing Dreams"
Start making memories like old timers do. are when your dreams come true." I realized that the goals forming in my head didn't involve much fun or making memories. That is the more important goal this year for our family. Sure, there are tough decisions to make and we have to buckle down and get serious about some things. But what my heart aches for is creating, enjoying and capturing life with my family. This year was the first autumn for our children. They weren't playing in the leaves at first. I asked them what was wrong and they replied, "We don't know what to do!" So I had to show them how to kick up the leaves and make a pile fit for jumping on. There are lots of new things about living in a place with four seasons they don't know anything about yet. I just can't wait to see the wonder in their eyes when they make their new discoveries. 1. Treat each family member special once a month. For each person's day that corresponds with their birthday (like 20th for me): take their picture, do something with them that they like to do, and serve a favorite food. 2. Take weekly pictures and video clips. A Lego creation or outfit ensemble or getting a new jewel for their Awana vest- short and sweet. Plus copy them onto DVD or CD once a month. 3. Visit a park at least once a week. You can always find people enjoying walking, biking or picnicking in a park here. A few days ago, while driving by the river, I noticed a path of stone stairs. We pulled over and walked. We were surprised to find a spring and some old stone retaining wall and crossed a creek by walking on a fallen tree. This short impromptu hiking trip was only two miles from where we live! 4. Attend a community event that highlights history and tradition of the city at least twice a month. This has been the best way to treat field trips since we moved here. There is always something awesome going on that can be enjoyed as a family. 5. Meet up with friends for dinner or dessert monthly. Instead of our usual Noche Buena, we went to the neighbors for cake and ice cream and sang Happy Birthday Jesus. That was so simple and lots of fun. 6. Continue family movie nights. Since working retail, my husband came home late most nights until two years ago. He switched stores and had much better hours. To celebrate, we started Family Movie Night. 7. Date-night-in as a couple is a must because we don't have regular babysitters. We watch a movie together and have more grown-up food like sushi or spicy salsa and chips. This year, we will watch classic Hollywood movies from the list, 100 Greatest Films. 8. Pray together everyday as a family. Nothing to it, just needs to get done. 9. Train as a family. Since we are no longer beach bums in a picturesque community, we have to be more alert to our surroundings and capable of defending ourselves. The children have been doing martial arts with their daddy since they were knee high. It's just mommy that needs to get with the program. 10. Laugh more. We all need to learn new jokes and laugh out loud more. I am still learning how to set goals. As the months progress, I am sure I'll add other goals. But I think this list is very doable and reflects my heart's desires. So this is the best place to start! This year, I'm hoping to find more books to listen to but also a few to read and enjoy. While I enjoy homeschooling, it is really boring just sitting with the kids waiting for them to ask me questions. They are getting independent doing their schoolwork and don't need me as much. But I still I have to keep an eye on them to make sure it's getting done. Having a book to read or knitting keeps me from falling asleep waiting. I've found that audio books are my thing. If I can find an equivalent audio book instead of having to sit and read a book, then I know I can finish the book. Anyway, I really got inspired by the booklist posted by Crystal from Money Saving Mom and all the comments from readers of what they plan to read. I'm looking forward to her monthly book reviews and will pick some of my new books from there for the following months. Send Out For FREE Samples with Surprise Coupons Too! In this one box from PG, I received 10 product samples and a cute little purse. Not only was it all FREE, but it came with coupon friends. Plenty of PG coupons in fact, making up for the Sunday of 12-9 when I decided not to buy the paper and missed out on 3 coupon inserts, including PG. It's easy to find out about these samples from money-saving sites like Hip2Save that I check at least once a day for coupons and deals. Also, Sweeties Freebies is a good site as is Woman Freebies. Even without a Facebook account, there are plenty of freebies from samples to be had. Most companies will ask for house address as well as an email account. I recommend getting a separate email account with a non-descript name (like w32firqx@...) to use just for samples or sweepstakes. Also, I don't choose to receive newsletters and promos. This does not seem to increase the number of samples the companies send. Stock-Up on Pumpkin Puree at Martin's AND Pumpkin Pie Dip Recipe! Martins has this Stokely's 28 oz can of pumpkin puree for only $1.79, a stock-up price in my opinion, even without a coupon. I didn't know there was another brand besides Libby's that sells pure pumpkin (that is not organic). Directions: Beat cream cheese til smooth. Mix in sugar then pumpkin puree. Add spices and mix well. That's it! We served ours with Stacy's Gingerbread Pita Chips. Target had these for $1.50 during the 50% off Christmas clearance. After trying the chips, I knew we had to make this dip. It was really great together. Send out for a sample of Eucerin Professional Repair. It doesn't say how big the sample will be. So here's hoping it's a good size. Thanks for the heads up, Money Saving Mom! CVS FREE Money with "Cashback" Rewards! We haven't had a credit card for many years (not for any real honorable reason... well, this is a rabbit trail for next time). Anyway, I have a bit of cashback envy. 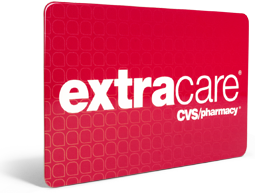 Thankfully, CVS doles out quarterly Extra Bucks Rewards to the tune of 2% back. Even with all the coupons I use at CVS and getting free items plus overage sometimes, I still get Extra Bucks Rewards. This past quarter was 4% back and I got a whopping $3!!! That's FREE money! Minus the credit card bill. I find it best to register the CVS card online. Having an account allows me to print extra coupons that print from the Magic Coupon Machine at home (not all but some good ones). Also, I can send my Extra Bucks and Beauty Rewards straight to my CVS card instead of having to print it out. Be sure to stop by CVS to get your quarterly bucks from the Magic Coupon Machine or load it to your card from the CVS website like I did. A couple of months before we moved from Florida, our pantry, fridge and freezer were crammed full of food. I didn't have to shop for weeks. And the last week before we left, I gave away bags and bags of food. One bag was just pasta. Then we still had lots of food in storage until we settled in to our new place in Virginia. The first month in our dream state of Virginia, we lived at Best Western. It was great but not much space for a stockpile. I also hardly shopped any sales. The only appliances available to me were a minifridge, microwave and a rice cooker. What a culture shock for a couponer! Now that it's been 9 months with a "normal" kitchen, and back to couponing, our pantry is slowly growing. So, perfect timing to eat down the pantry. Besides, how can I fit new finds in there if there is no space! With the new Pantry Challenge from Life as Mom, I feel encouraged to do this right in the beginning of the year. What a great way to jumpstart saving money! One of the ladies left a comment on the post above saying they would save money for buying new tires. Well, we need to buy a couple of tires too! 1. Save $150 (about 2/3rds of our grocery budget). 2. Get used to alternative protein sources. 3. Spend $150 for staples like milk and bread and stockpiling only really, really great deals to use for the next months. 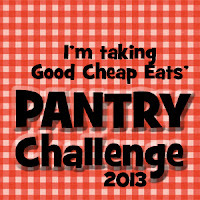 We are going to try this Pantry Challenge this month. The pantry has an assortment of items that don't really go well together. We'll have to see how long we can last without going to the store (except for some milk and bread now and again). So here's to the first menu plan of the year! This humble menu plan is linked to orgjunkie.com.